Today two families become one. Pick a Seat not a side. 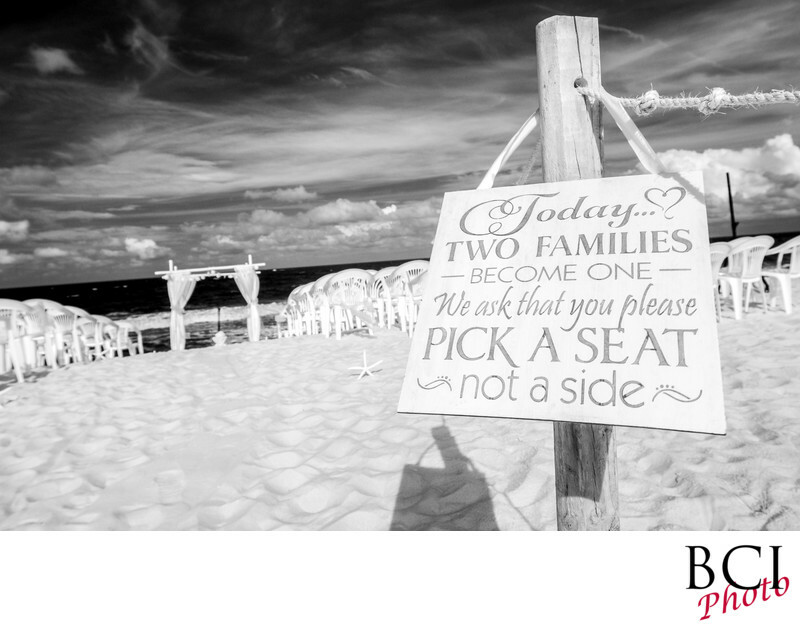 Which is a great sentiment and eases the burden of where to sit on their wedding guests. Typically we would shoot this a couple of different ways, using both visible light (normal light) and as here; Infrared light which renders things a little differently. Especially nice here the sand is all glowing and the clouds really pop. Check out our infrared gallery to see more of the incredible and unique imagery we provide to our wedding clients via the use of infrared imagery. Not just a photoshop trick, these images are captured using a custom modified camera that can only "see" the infrared part of the light spectrum. Covering weddings with some infrared images is something we've specialized in since 2003. We've really pioneered the use of infrared technologies in the wedding arena, and have excelled here even while others have dabbled in it only to find it was too difficult to achieve great results like we do all time. Thus leaving us once again, the exclusive photographers on the treasure coast who shoot Infrared images. call or text us today to start your unique wedding photo journey with us today.